Things are getting packed and it is starting to look a little sparse. Our 12+ years here are drawing to a close. Cathedral Place (left) has only just replaced the old Art-Deco glory of the Medical Arts Building as a monument of fibreglass, post-Modern crap (can you tell I don't like that building?) There is no Olympic countdown clock in front of the VAG. 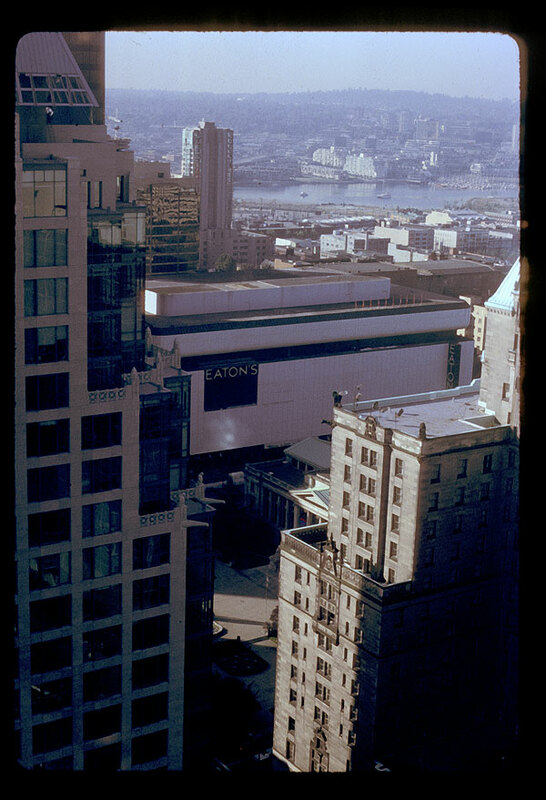 Eaton's is still Canadian and spelled with capital letters. There are no towers in Yaletown and the Expo '86 site is still a vacant wasteland while Concord Pacific and the provincial government argue over who should pay for the site remediation. And if you look at False Creek at the far right of the picture you can just make out a white smudge that is the ill-fated McBarge, which now floats derelict in the Burrard Inlet. Oddly enough I happen to own a complete set of blueprints to the McBarge. First, I want to thank everyone who has sent my happy birthday wishes and everyone who came out for my party on Sunday. I had a marvellous time. All the gifts were lovely and those that were buying me drinks succeed in getting me thoroughly plastered. Thank you all. May I never have to suffer the illogic of others again. Of course I may as well wish for immortality, world peace, and the abolition of taxes. Never forget - they turn up when you least expect it, not to mention where you least expect it!